The corporate education reporters have been working overtime to downplay Rhee's big lie that she has been repeating for years about the miracle test scores of children at the Baltimore school where she taught in the early 1990s. It makes one wonder if they will notice that she has now moved on to add to her repertoire of extreme fabrications. Jay Mathews will probably say that we cannot be sure if Rhee, now secure in her role as the Sarah Palin of corporate ed reform, knows that the lies she's telling now are lies. Hey, she could just be repeating fake facts that she has been handed by the same gofers to the Oligarchs who supplied the fake facts for Guggenheim's not-nominated-for-an Oscar, Waiting for Superman. What do we know?! "When I travel around the country talking about these issues, I inevitably come up against, you know, wealthy folks in the suburbs who say, 'Well, but my kids are fine,'" Michelle Rhee, a former Washington, D.C., schools chancellor, said during a recent gathering at The Daily. Could Rhee have gotten her numbers from Klein's researchers over at Fox News, where they simply make it up when the facts don't support their agenda? Michelle certainly did not get them from the most recent international test comparison (PISA) published by OECD, which has been all over the media since early December. 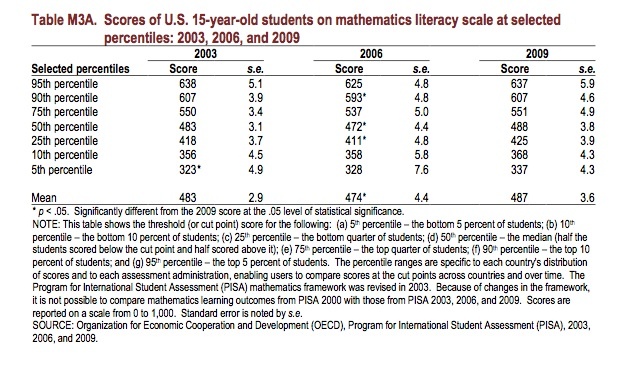 As reported by the NYTimes, the Program for International Student Assessment shows the only slight improvement overall to the mediocre U. S. results in 2006. 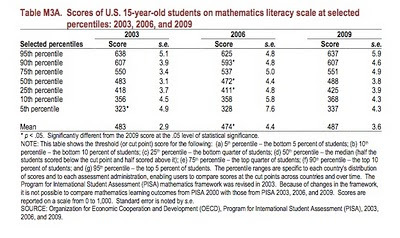 In Math in 2009, the U. S. was placed 31th of 32 nations; in Reading, the U. S. finished 17th; in Science, 23rd. So what's wrong with Rhee's averaging out sort of to get 25th? 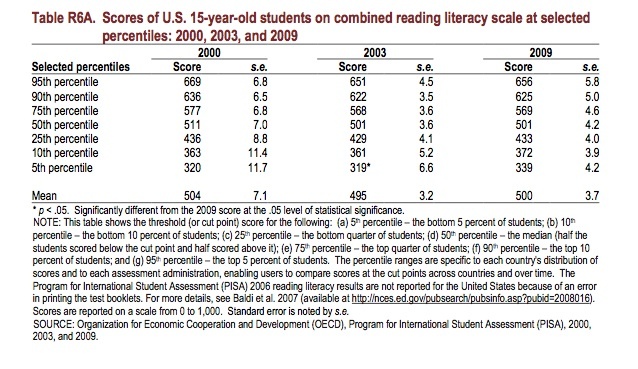 Rhee's claim is that the top 5% of students have these low scores, when, in fact, they do not. Not even close. 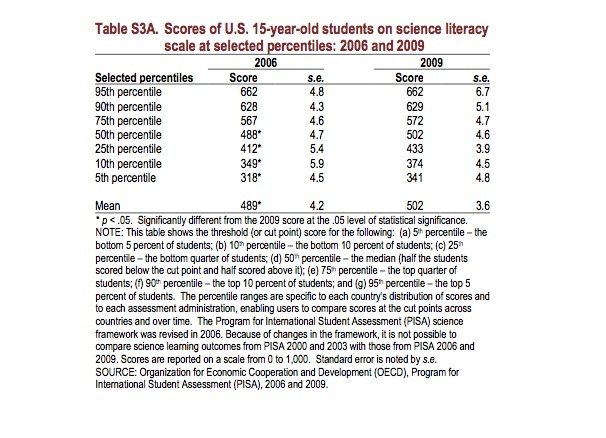 OECD disaggregates scores based on percentile rankings, and here are the results below, for reading, math, and science. Contrary to Rhee's lie, our top students 10% (90th percentil of students outscore any nation and the Chinese city-state, Shanghai. When you look at the top 5% of American students (95th percentile), these kids leave the rest of the world in the dust in reading, math, and science. Click any of the charts to enlarge. In reading, top-scoring Shanghai scored 556. As you can see, our top 25% bested that score. In math, top-scoring Shanghai scored 600. Our top 10% of students beat this score by 7 points, and our top 5% of students, Ms. Rhee, beat the best in the world by 37 points. Shanghai, again, was top scorer in science, too, with a score of 575. Our top students, again, leave these scores in the dust. And so, we come back to what it would take to make the U. S. #1 in international test scores. Rather than tearing down our public schools in urban America and replacing them with penal pedagogy testing camps, we would be much better served all round to use our resources to get our bottom quintile of children out of poverty. This would do more to raise their test scores and hopes, along our nation's moral standing, than any increasingly-stupid and outdated corporate education reform that can be pounded into place by the hard white fists of reactionary reformers. The hacks and has-beens who make up these lies to promote the takeover of our schools by anti-democratic corporate swindlers should be ashamed. Then they should be tarred and feathers and ridden out of town on rail, or at least a broom. · Of all the nations participating in the PISA assessment, the U.S. has, by far, the largest number of students living in poverty--21.7%. The next closest nations in terms of poverty levels are the United Kingdom and New Zealand have poverty rates that are 75% of ours. · U.S. students in schools with 10% or less poverty are number one country in the world. 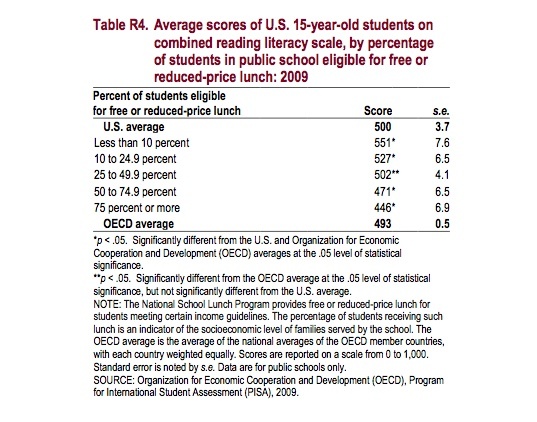 · U.S. students in schools with 10-24.9% poverty are third behind Korea, and Finland. · U.S. students in schools with 25-50% poverty are tenth in the world. · U.S. students in schools with greater than 50% poverty are near the bottom. A seat at the table or a piece of the pie?